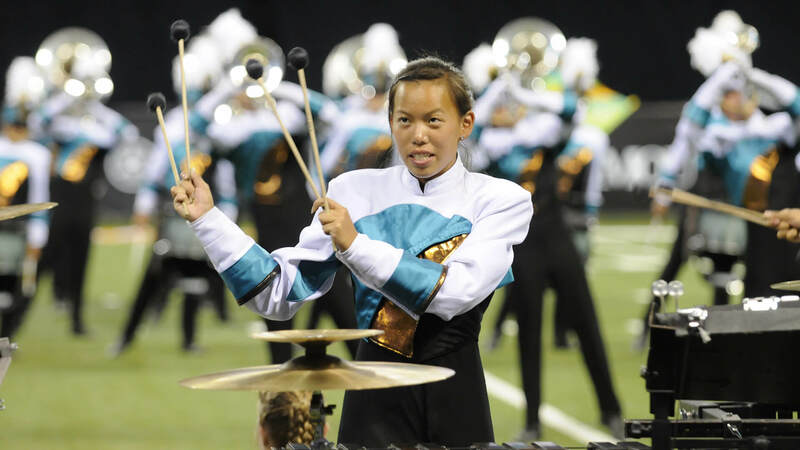 The 2011 Drum Corps International Tour was the first that both Open Class and World Class corps competed against one another starting with the World Championship Prelims in Indianapolis. At the season-ending series of events, there was a pretty healthy spread of more than three points between the 12th-place Spirit of Atlanta and 13th-place Glassmen, the latter corps missing a spot among the top-12 finalists for the first time since 2004. 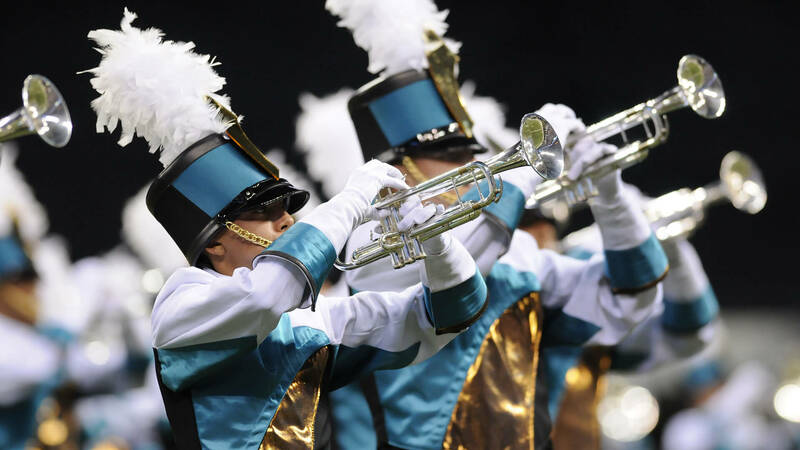 Just two-tenths of a point behind was the Troopers; with Academy, Colts and Crossmen filling in the placements above the 18th-place Pacific Crest. Pacific Crest’s production, “Push, Pull, Twist, Turn,” often relied on arrows as a recurring visual device, reflecting the theme of being pushed around and being told where to go. Throughout, someone was always being pushed out of the way, pulled around the field, twisted into unnatural forms or turned around to the recurring six-note figure of 16th notes, with drill formations reflecting each of the actions exemplified in the titles of the four sections. The theme was more conceptual than blatant, requiring the audience to pay close attention to observe each of the four main titled elements. Throughout the show, the color guard members got into the act by pushing around objects and people that sometimes were imaginary. However, actual members were often pushed around or shoved out of the way of an oncoming segment of drill, at times pulled across the field or twisted and turned around inside the formations unfolding on the football field. The show kicked off with Ron Nelson's “Lauds (Praise High Day),” commissioned in 1991 by the U.S. Air Force Band. An energetically boisterous work, it was written by Nelson to express praise and glorification. The work represented one of the seven canonical hours chosen by St. Benedict for monks to observe official daily prayers; in particular, honoring the sunrise with the grandeur and anticipation of a new day. The giant arrow form with which the corps opened the show, stretching from the front center of the field to the very upper right corner, would become a recurring visual effect. 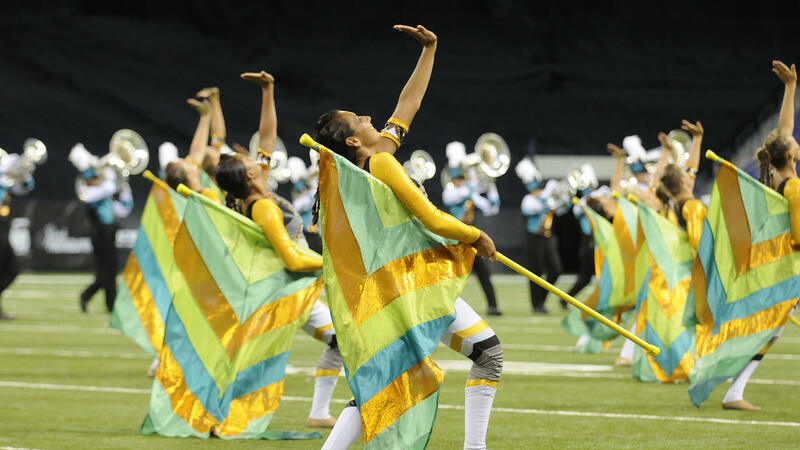 As a lone color guard performer ran through the two lines of brass players in the shaft of the arrow, the horns spread apart and just as quickly were drawn back toward one another. As the formations evolved, some part of an arrow was often seen somewhere in the drill. Robert W. Smith’s “Push,” a recent publication, was incorporated into Nelson’s opener. A driving two-note ascending motive musically embodied the concept of “push” with elements of aggression coexisting with jazzy funk. Arrows in the drill and on the flags pointed to the ways people were pushed toward conflict instead of toward a resolution of reconciliation. One line of color guard members pushed through two lines of brass players, followed by a small circle of brass pushing through the rest of the corps. A particularly effective routine was when a line of rifle spinners tossed their equipment and were mock pushed out of the by a second line of color guard members who then caught the rifles. This led to a substantial guard feature at the front of the field highlighted by the use of green and gold flags. After a short percussion mallet feature that saw the dissolution of two blocks of horns in the drill formations, an achingly beautiful “Adagietto” from Mahler's “Symphony No 5” fulfilled the “Pull” segment with a continuously building tension and release. This culminated in a climactic moment where short golden flags were unfurled to unveil much longer white silks, following up on a section near the beginning of the piece when a smaller white banner was twisted into knots. Written in 1901-1902, this fourth movement from the symphony was originally scored only for strings and harp and has been said to represent Mahler’s love song to his wife, Alma. It was written soon after a serious hemorrhage that almost killed the composer, so the concept of “pull” could also be seen as reflecting gratitude for being alive, being pulled away from travesty to realize that the surrounding world is one of beauty and promise. The pushing and pulling on flagpoles continued into “Pianos,” the first movement of Danny Elfman's “Serenade Schizophrenia,” providing the “twists” in the storyline of the show. This piece marked the first of six movements of his composition written in 2005 on commission of the American Composers Orchestra for a debut at Carnegie Hall. It was the first orchestral work of the former lead singer (1974-1995) of the rock band Oingo Boingo not written for a feature film. During this part of the production, six lines of performers snaked through each other as if segments of a DNA helix; followed by choreography that required corps members to often twist beyond the realm of comfort during numerous short drum breaks. The music was particularly disturbing, as if someone was being pushed too hard in the wrong direction. Jack Stamp's forceful “AirLink” fulfilled the "Turn" portion of the show and served as the finale. It was commissioned by the Pennsylvania Music Educators Association for its 2008 All-State Honor Band. The movement featured many drill rotations and lots of spinning color guard equipment, ending with a loud and glorious finale that had to have turned heads. This week you can save on the World Championship DVD set that contains this Pacific Crest performance. Buy the 2011 DCI World Championship Volume II DVD set.